NEW LOWER PRICE!! NEED AN OFFER!! Sea Ray's 38 Aft Cabin is a traditional double-cabin cruiser that offers contemporary styling and huge accommodations and always at a great price! 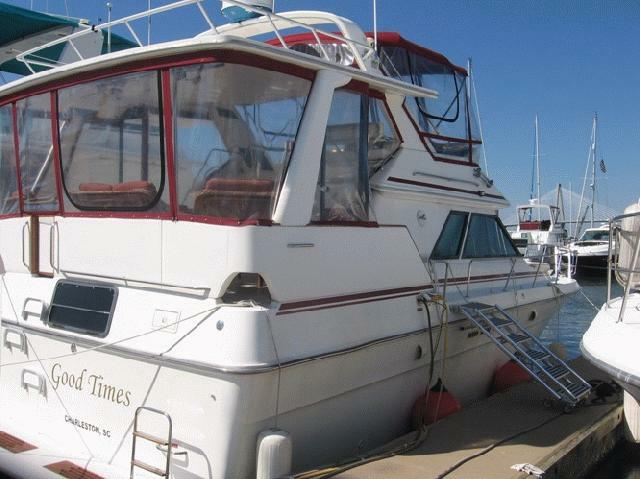 "GOOD TIMES" has many recent upgrades including: newly rebuilt Mercruiser engines with only 50 hours, new genset, new Garmin GPS, new folding boarding ladder, new aft boarding ladder, new forward AC, new plumbing including holding tanks and a new entertainment center featuring 2 24" flat screens, surround sound, 5 disc CD changer and 4 new topside speakers! Take a look! You will like what you see! Contact John Douglas at 843-425-6888 or email john@charlestonharboryachtsales.com for more information. Contact Charleston Harbor Yacht Sales.